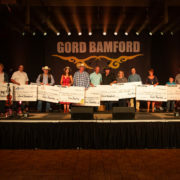 Lacombe, Alberta – Heading into its 11th year The Gord Bamford Foundation is poised to continue supporting its mission to provide funds to youth supporting charities across Canada that involve music, education, health care, sports, and multi-use facilities. In its ten year history the event has generated over 3.1 million dollars. This yearly event hosted in central Alberta continues to be the main source of funds to the Foundation. The charity golf classic will again be held at the Sheraton Hotel Exhibition Hall in Red Deer, Alberta on August 15th and at the Lacombe Golf and Country Club on August 16th, 2018. “It’s hard to believe that we are rolling into our second decade of working on the event. We have developed a wonderful event with our generous sponsors, volunteers and committee members. We’ve also established great partnerships with worthwhile charities. I love supporting organizations in the community that I grew up in and am happy that the Foundations’ success has also allowed us to reach charities all across Canada,” said Gord Bamford. Last August the event raised $393,534 and it carries a goal of surpassing that total this year. These funds were proudly distributed to a number of youth-serving charities like Big Brothers Big Sisters of Lacombe and District, MusiCounts, Canadian Tire’s Jumpstart, and the Hockey Alberta Foundation to name a few. Other major recipients include the Gary W. Harris Canada Games Centre which will play a major part in the upcoming 2019 Canada Games in Red Deer, and will be a much-used facility for years to come. The Central Alberta Child Advocacy Centre will continue to receive support. With plans of introducing additional fundraising events like the Gord Bamford Pics and Sticks hockey events in Red Deer and South Okanagan, The Gord Bamford Foundation feels poised to enter into another ten years of supporting Canada’s youth from coast to coast. 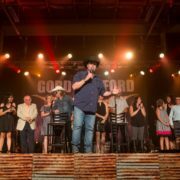 Lacombe, Alberta – Alberta-based charity, The Gord Bamford Foundation, has released the names of new charities that will benefit from his Foundations’ work. 2017 marked the 10th anniversary of the Foundation’s largest fundraiser, a golf tournament and gala, where the goal of surpassing the 3 million dollar mark was reached. Over the past ten years, the Gord Bamford Foundation has supported over 60 different organizations with a focus on music, education, health care, sports, and multi-use facilities that benefit youth across Canada. With the 11th Annual Gord Bamford Charity Golf Classic set for August 15th and 16th 2018, the Foundation is in a good, established position to commit to long term partnerships. “I’m really proud to see the list of beneficiaries grow every year. We know that by committing dollars long-term, even when spread over a number of years, we can assist charities to plan and prepare for their upcoming needs. From supplies, to space, to the development of important programs,” said Gord Bamford. The Foundation is also proud to have partnerships with Make-A-Wish Foundation, Central Alberta Child Advocacy Centre, Creative Kids Saskatchewan, The Sutter Fund, Central Alberta Ringette Club, and Central Alberta Buccaneers Football Club. About the Gord Bamford Foundation: As a not for profit organization, The Gord Bamford Foundation is passionate about supporting youth. As a Foundation we provide funds for initiatives that include or involve music, education, health care, sports, and multi-use facilities that benefit youth across Canada. Lacombe, Alberta – International country music star and Sony Music Canada recording artist Gord Bamford raised a total of $393,534 at the 10th Annual Gord Bamford Charity Golf Classic in Alberta, Canada on August 9th and 10th, 2017. Meeting their fundraising goal, Gord and his committee are celebrating breaking the 3 million dollar mark with his charity. Monies from The Gord Bamford Charitable Foundation are delivered to a variety of youth-centered charities across the country like Big Brothers and Big Sisters, MusicCounts, and Children’s Hospitals to name a few. During the evening, Gord Bamford was also honoured with the Big Brothers and Big Sisters National Alumni Award for his Foundations contributions. Gord was enrolled in the Big Brothers and Big Sisters program in the 6th grade and he credits his big brother for helping him stay on such a great path growing up. Sponsored by ole Majorly Indie was a songwriters round that included Buddy Owens, Phillip White, Brice Long, and Brett Jones. On top of that, Dallas Smith and Gord himself entertained the 700+ people who attended the sold-out event. Well-known names from the sports world including Marty McSorley, Mark Recchi, Theo Fleury and Brad Gushue, just to name a few, were auctioned off to the golf teams who were given the opportunity to golf alongside their purchased celebrity the following day. Veterans of the event Kris Russel and Curtis Glencross found themselves in the celebrity auction once again. Contributing to the fundraising total in the live auction was a trip to the Queen Charlotte Lodge which brought in $10,000, a live-painted Lewis Lavoie piece of art for $8,500, and the Calgary Flames Hockey Organization donated several experience packages that helped lift the overall fundraising total. The Gala took place at the Sheraton Hotel in Red Deer, Alberta near the central-Alberta town where Bamford grew up and the Lacombe Golf and Country Club hosted the golfers for the 10th straight year. Gord expressed his thanks for the overwhelming support that’s been received over the past decade from sponsors, volunteers, and the music community alike. Alberta-based business JEDCO Energy Services stepped up once again as title sponsor and Central Alberta’s biggest and most well-known hockey family, the Sutter’s, showed up bearing generous donations and participated in a special hot-stove interview for VIP guests.